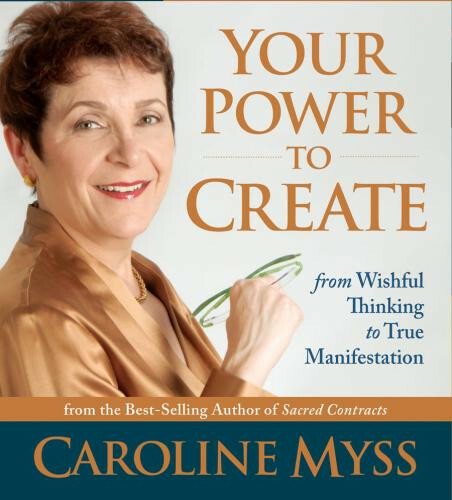 Caroline Myss cuts through the myths of manifestation to help unlock your personal power. Where did this notion that we have the power to shape our own destiny come from? How can we separate wishful daydreams from the authentic work of creation? Caroline Myss teaches that the ability to shape reality is a divine gift—but it is a gift that must be trained, strengthened, and practiced as a living discipline every day. Now, this gifted teacher brings her trademark passion, candor, and extraordinary insight to help you unlock Your Power to Create. Very difficult listening to this, her ego is so out of control. Re listening disc 2, so many times she repeats how she is right, so many other people are wrong, and how great she is. It is very sad that what used to be such a great teacher has deteriorated into an ego-centric harpy. She still has a lot of knowledge, but it is corrupted by her jaundiced view of others. I find Myss sometimes brilliant but often expressing what is important to her in ways that are simply her own unprocessed and unhealed anger about the choices people make. It turns very quickly into what I hear as arrogance, pessimism, and deep negative judgments of the very people she is trying to help. I find it quite possible to express everything that is important to her in ways that INVITE people to be inspired to touch the willingness inside themselves to change their lives. Instead she treats it as if she and a few rare individuals on the planet are willing to do that and completely misunderstands the power we have as healers to help people touch that inspiration inside of themselves to take the journey. Her account of history is hugely overgeneralizing, and her constant use of the second person ("you do this because... you think that because... you fear this because...") did not resonate once with me. I find that she also has a tendency to make self-sacrifice seem like a virtue. I believe that much of her dissatisfaction with the people she works with would shift if she learned how to communicate her ideas in a more compassionate inspiring way. I wonder if she asked herself her own questions - Is she really ok with turning away hundreds of people and being angry all the time because she clearly hasn't healed around her own issues? What she presents as passion, I see as unhealed pain. There's better ways to do it. If you are interested in building community, fostering conscious interdependence, Healing your relationships, and cultivating open-hearted compassion, I recommend going elsewhere. Caroline has a lot of teaching to share, but when she gets caught in her negative attitudes towards people she spends most of her time expressing her anger and disdain for people and not much teaching gets done. There are some nuggets here, some things to be learned, but for me, when the teacher gets so negative, i start to doubt the validity and depth of their understanding. I really wish Sounds True had stood up to Ms. Myss and made her re-record this when she was in a better mood. As a discount download i am getting my money's worth, but if i had paid full price for this i might be asking for my money back.